This Alice in Wonderland teapot set is from Disney Tokyo. Do my eyes deceive me, or does it feature three spouts? This curiously flattened Alice teapot is from Vista Allegre. 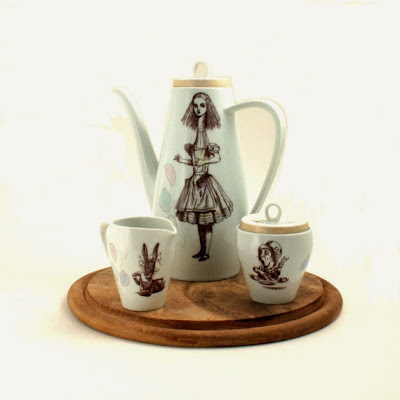 I think it's quite clever how this Alice teapot depicts Alice all stretched out all on the long skinny teapot! The artwork on this Alice in Wonderland teapot is kind of wonky and funky, but I like the white rabbit on top of the teapot lid! This Mad Hatter figural teapot cracks me up! It's by Paul Cardew. This teapot is a replica of the level 2 weapon in the game Alice: Madness Returns. Chuckle. 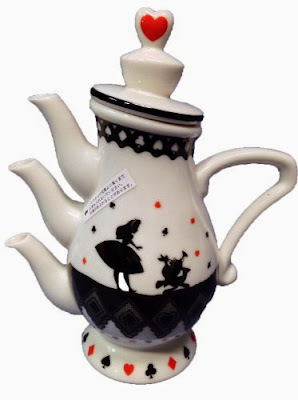 Here's another three spout teapot featuring Alice in Wonderland. It's from Disney Parks. This Alice face figural teapot is a bit disturbing, do you agree?